For a fun and comfy time at the beach, a beach blanket is often the best option. Unlike heavy beach chairs, it is easy to carry and weighs next to nothing. A good quality beach blanket should be durable enough to withstand water and sand. Not only should it be hardy, but it should also offer some level of comfort. These are the two extremes that the best beach blanket has to straddle. Thankfully, there are plenty of quality products out there that do this quite well. 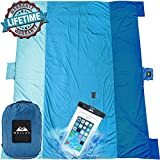 So, let’s check out the best beach blanket options for your summer vacation in our short but in-depth review. This is a large, oversized beach towel with the dimensions of 74” x 74”. It is made from extremely plush microfiber materials. These blankets are available in tow color options: you can pick either the black and white palm tree design for a classy look or the multicolored brushstrokes for a more vibrant effect. The fabric is a blend of polyester and nylon. It is a rapid drying material, which makes it perfect for a day at the seaside. The material is machine washable and easy to clean. You could fit an entire family for a picnic on this soft blanket. At 9 feet by 10 feet, this blanket is absolutely massive. The WellaX is made from durable nylon fabric, the kind you use in parachutes. It is only available in one color, blue, but it doesn’t look half bad out on the golden yellow sands! Despite its gargantuan size when unfolded, this blanket weighs just 16oz when folded. It is exceptionally compact and travel-friendly. The nylon used in this blanket is water repellant and does not conduct heat very well either. It is easy to clean, as you can simply brush off the sand. The blanket comes with a carry case as well. There are four pockets on the sides of the blanket that can be weighed down in windy conditions. 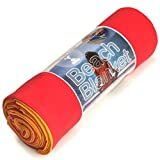 This is an excellent blanket for large groups or families on the beach. Let’s move on to the next level when it comes to the best beach blanket. This Cotton Craft blanket is quite small and cozy at 58 x 68”, ideal for couples. 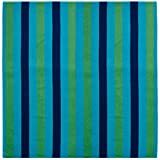 There are two color choices: a sober navy green turquoise striped affair, and a bright rainbow color striped version. The material used in this blanket is pure ringspun cotton with a velour finish. You will get a lot of plush comfort from this beach blanket for sure. The towels weigh around 2.52 lbs, which is acceptable when you consider the comfort on offer. They are also quite easy to clean and maintain, as they are machine washable. This is a massive blanket that measures 9’ by 10’. It is made for the beach and has a durable nylon construction. These blankets are available in two shades: purple and bright blue, both with dark blue exteriors. The material is ripstop nylon, which has solid water and sand repelling abilities. The blanket is extremely thin and lightweight. To prevent any flapping in the wind, these blankets come equipped with side pockets and anchoring loops. You also get a compact travel pouch for easy portability. Live Infinitely also provides a 1-year unlimited warranty with their product. At 64 by 76 inches, these can be considered mid-size beach blankets. They prioritize comfort with the use of soft microfiber cloth. There are numerous colors and printed designs on offer, more than a dozen in fact. They include plain as well as striped blankets. This is the same brand officially used by LA County Lifeguards, so you can rest assured that they are built for use on the sand. The material is 100 microfiber cloth, which is comfortable yet easy to maintain. It can be washed in a machine. The blanket can be anchored to the floor using anchor pockets in the corners. You can fill these with sand or rocks to weigh the blanket down. This is a large multipurpose outdoor blanket from Scuddles. It measures 59 x 76 inches and has a multilayer polyester construction. In the looks department, the Scuddles striped blankets are available in three different color combinations. The dominant colors are blue, orange, and red. The material used is 100% polyester. The outer layer is made of a rich fleece-like material that offers maximum comfort. The inner layer is durable polyester fiber with a PEVA coating. The PEVA keeps water away, and the blanket is easy to clean as well. Though it weights 2.5 lbs, portability is one of the highlights of this blanket. It looks and feels like a bag when completely folded, replete with carrying handles. This is a unique looking piece with a round design, instead of the usual rectangular shape. The blanket measures 70” and is made from 100% cotton. As the name suggests, these towels have elaborate mandala patterns. There are several different color combinations on offer. The roundie blankets are incredibly versatile. You can use them on the beach, during picnics, indoors on your couch, or even on the walls as a decorative piece. The cotton blankets are quite comfortable and easy to clean. They need to be hand-washed, however. These are sturdy nylon blankets designed for outdoor use and abuse. They are very large, measuring around 7 feet by 9 feet. The colors on offer from WildHorn include aqua blue, sky blue, dark blue, and nectar purple. All these colors are mixed with grey on either the sides or the center of the blanket. The parachute nylon used in these blankets makes them very hardy. They are not affected by either sand or water, which makes them perfect for a day out on the beach. The blankets are also very travel-friendly. You get a stuff-sack with each blanket. 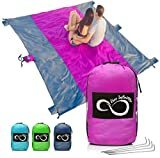 You can fold the blanket and stuff it inside the sack for easy transportation. With around 63 square feet on offer, this is the best beach blanket for large groups or families. The anchor pockets on the sides allow you to keep the blankets safely moored on the ground. This mat with strap measures around 60 x 78 inches when spread out on the sand. It is made from highly durable PPE weave. These are striped blankets, available in three different color combinations. When folded, they look like handbags/carry bags, due to attached straps. The PPE fibers used here make these blankets both waterproof and easy to maintain. They can be washed using just mild soap and water. The blankets are also highly resistant to mildew. Thanks to the straps, these are very easy to carry around and transport. The blankets have pockets on the sides that can be used to weigh them down. This is the best beach blanket for couples. This is a high quality, multi-material outdoor blanket from JJ Cole. It measures 5’ x 5’ when spread out. The blanket has a striped design with dark borders. It looks very sober and mature, with a combo of dark and grey shades. The fabric used is polyester, but it has been fortified with an outer layer of PU for maximum durability in the sand. There is even a filling of PU foam for superior comfort. The blanket has a detachable strap that makes it easy to transport. This is a very stylish and classy blanket for all kinds of outdoor use. There are several options when it comes to beach blankets. Some prefer the comfort offered by soft microfiber cloth, while others go for the durability and ease of maintenance offered by nylon or polyester. 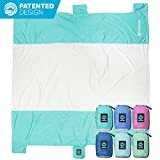 Regardless of your preference, you should be able to find the best beach blanket to fit your needs from the top 10 list above. If the best beach blanket you’ve ever tested out is not on this list, tell us about it in the comments section.